While studying she worked as a freelancer for several projects and institutions, for example for the Ästhetik-Kongress Hannover in 1992 and at the broadcasting stations Norddeutscher Rundfunk (NDR) in Hanover and Westdeutscher Rundfunk (WDR) in Cologne. 2003 foundation of atelier Al-Sabbagh: paintings, illustrations, calligraphy and walldesign. 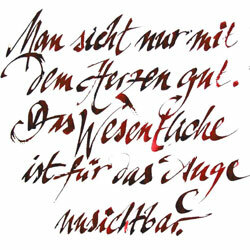 Calligraphy: Agnete Sabbagh uses a wide range of materials such as indian ink, water colour, pencils and coloured pencils. Within this range she can give you a stylistic very exact drawing, or on the other hand the paintwork of Japanese ink drawing. Other specialities include: specially prepared roughcasted canvas or wood. This particular preperation will point out a special effects on its own.